Our move entailed a lot of challenges, small and great. That’s inevitable, whether the changes are coming by enthusiastic desire or unwilling necessity. Moving is stressful. Several of our friends, at various times, expressed their sympathetic dismay that we had to leave our home after so many years. The circumstances were not entirely of our choosing, a combination of physical and financial problems. This house was where we had raised our family; we moved in with three pre-schoolers and then had three more children, rearranging and remodeling through the years to fit them in. We were no longer distressed at the fact that we had to leave. The Lord had whispered that He had other plans, and He brought things together so unmistakably that we all we could do was go forward, and keep praying and plugging away at the daunting tasks involved. We had had a long history in this home, and it had been a good place for us. Nothing can diminish the memories of all that we had lived and learned within those walls. Now a new young family would do their own growing there. Their prayers and needs as well as ours were being answered, and it was impossible not to feel blessed. The burdens of physically accomplishing all that we needed to do were large, however. And no matter how happy or unhappy the choice to relocate is, there are inevitably a lot of adjustments; things you will miss about your life before, and things you will have to figure out how to do with your new circumstances and surroundings. I miss having neighbors around. We sit on a corner, with a vacant lot next to us and a presently empty property behind us. I miss the neighbors from the old block, to stop and chat with as we each came and went. Finding a house for the price of an apartment was a blessing; we had space to set up a workable life for us. Finding a house with a basement was a gift. That basement meant that we could bring our freezer and food storage, and things we still have to get to our kids. However, there is no interior stairway; you have to go out the back door, to the corner and turn down the stairwell. This will be more of a problem come winter when it’s pouring rain all the time! We were pushed into this place a little faster than we anticipated. Though the packing and transferring process took a while, we moved ourselves over to the new address the last weekend of March. We had been talking about the end of summer as moving time, but that’s not how it happened. That meant that I didn’t have the pleasure, for one last spring, of all the April cherry blossoms. I loved to stop and take a deep visual inhale of the trees that the city planted up and down both sides of our double-length block fifteen years ago. I could see them through the window as I went up and down the stairs, or every time I opened the front door, or arrived home in my car. I loved to set off under them on my daily walks, and then, reaching my home street again, walk through them to arrive at my home. 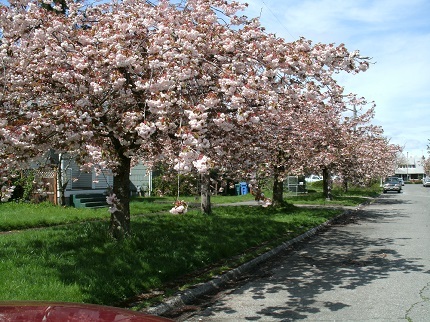 The cherry blossoms of our old street live on, if only in pictures. However, there were large old trees at the new place, filled with white blossoms. I didn’t know what they were, but they were beautiful in bloom and would be good shade in summer. Spaced along the side street, one tree was at the front corner of our property, matched by one in the middle and one just over the fence behind us. There was a large camellia bush at the front corner, whose branches reached around to the window of the little vestibule inside our front door. The house runs in its length front to back, rather than side to side, and the entry is at that edge. We wouldn’t have one more year with our fruit trees, either. Besides the two plum trees that were there before us, we left behind two apple trees. One, a red gravenstein, was a gift, planted a year later. I told its story in my column of September 19, 2012. The one my husband planted was an old-time variety that you will never see in a store, a yellow transparent. He had one growing up, and he wanted the same kind. Transparents are a very pale, soft apple, and they go from ready to ruined pretty quickly. They don’t ship or store well, so they aren’t grown commercially. They are a tart cooking apple, and they basically disintegrate when cooked, but they do have amazing flavor. They also come on early compared to most apple varieties. One day in mid-summer I stepped out the kitchen door and glanced up towards that big lovely tree just over the fence. I was astonished to realize that there were apples on the branches. The differentiation of shape and color had now revealed what had not been previously apparent: this was an apple tree! I went back inside, through the house and out the front door to stand under the tree in our front corner and peer up into it. In early spring, the white flowers had been identical. The leaves had looked identical. The sizes, thus probably the age, had been the same, so I supposed that they all might have been planted about the same time. Did this mean that there were apples on our tree? No, it did not. There were no apples hiding out from us here, or on the tree in the middle. There were only apples on the tree drooping over our fence from behind. What kind of apples would they be? With no history available to us, we had no idea. They were developing quickly enough that we decided it was likely that they were a green or yellow variety, and not red, but all we could do was watch and find out. The property was owned by our same landlords, and it was vacant, so we had permission to pick them when they were ready. The property manager agreed that they shouldn’t go to waste. It became clear that they were an early variety, something yellow. One, way up in the branches, caught the sun one day and looked almost silvery. What were the chances, I thought for a brief instant? It used to be a popular variety, and it’s an old tree. But I didn’t say anything. Time would reveal the answer. His favorite apple in all the world; he’s not really an apple person otherwise. I had a sudden image and laughed a little. And for me? The other tree I hadn’t paid much attention to, whose branches drop over the very back corner of the fence, has pears on it. I’ve always wanted a pear tree.